Are there any vegetables that you absolutely will not eat? I have a few that I could do without, and a few that I like prepared some ways but not others, but I can’t think of very many that I just won’t eat. Carrots and tomatoes, I’ll eat cooked, but not fresh. I’ll eat spinach raw (although I don’t enjoy it much), but unless it’s mixed in with a lot of other things, I won’t eat it cooked. I like peas sometimes, in small amounts, although snow peas can show up on my plate anytime and I’ll happily chow down on them. I try to push myself to give all these things another try once in a while (except my dreaded raw tomatoes), but whenever I do, I quickly conclude, “Okay, I just don’t like this.” And I think that’s okay; we don’t have to like everything, even healthy foods, as long as we’re eating a well-rounded diet. Unfortunately, there are some people who don’t like any vegetables. And that can be a problem! A lot of kids just aren’t big on veggies, so parents try to find ways to sneak them in by throwing butternut squash into mac & cheese or shredded zucchini into muffins. When The Real Deal asked me to create a kid-friendly lunch, I was inspired by their sneaky Veggie Chips to find a way to pack veggies into a sandwich or wrap. 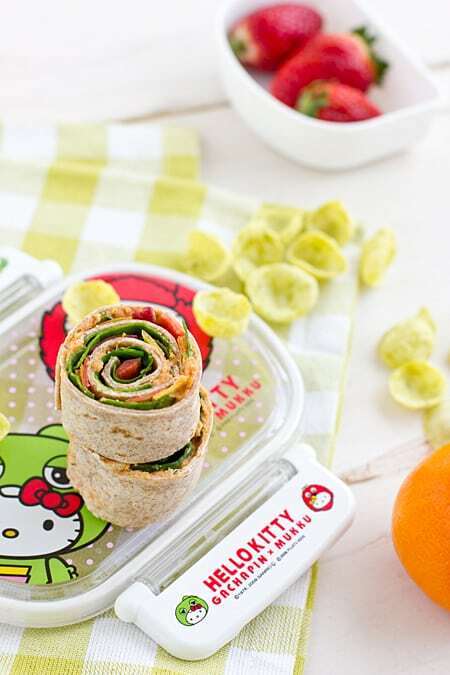 And since there are a few veggies that I’m not fond of, I thought that if I could get myself to eat them in this wrap, kids would eat them too. Because when it comes to spinach? I’m kind of like a little kid. So how about Hummus Wraps? Roll your wrap up, slice it, and you have colorful veggie pinwheels! Maybe they’re not as sneaky as butternut mac & cheese, but I think they’ll please most picky eaters. I mean, I loved them, and raw carrots are pretty much a deal-breaker for me in any meal! Serve these up with a side of The Real Deal’s tasty baked Veggie Chips and you’ve got a healthy lunch for even the most stubborn veggie haters. I’m not a big fan of peas, the main ingredient in these chips, but I can’t stop eating them. (Especially the very not kid-friendly spicy Sriracha flavor –yes, they make Sriracha-flavored Veggie Chips!) 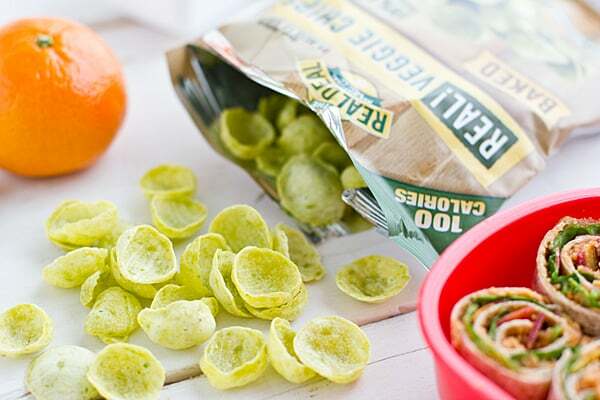 While baby carrots or celery sticks would be the best option, for kids who absolutely won’t touch fresh veggies, The Real Deal Veggie Chips are much better than fried potato chips or any snack food ending in -tos or beginning with the word Cheesy. Veggie Chips are natural, gluten-free, and a snack-sized bag contains only 100 calories and 2 grams of fat–an ounce of Veggie Chips has a serving and a half of vegetables too. Tomatoes, spinach, carrots and peas, all in one meal. And I loved it! 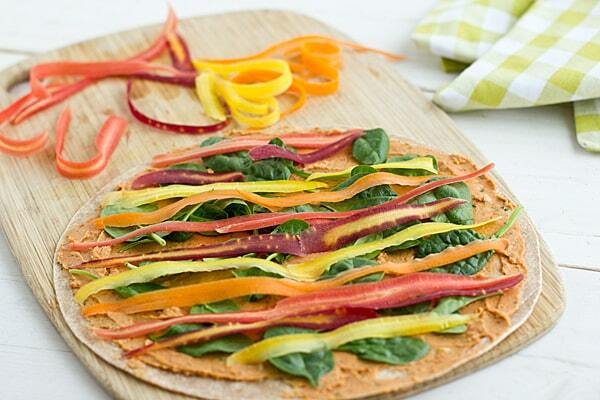 A tasty, colorful wrap made with Slow-Roasted Tomato & Basil Hummus, spinach, and carrots. Make the hummus up to 2 days in advance. Preheat oven to 225˚F. Line a rimmed baking sheet with parchment paper. Place tomatoes cut-side up on baking sheet. Spray with olive oil. Bake for about 3 hours, or until tomatoes are shriveled, but still soft. Cool slightly. Combine tomatoes, chickpeas, olive oil, vegetable broth, basil leaves, lemon juice, tomato paste, and garlic in food processor. Process until smooth; add additional vegetable broth if needed. Season with salt and pepper to taste. Spread hummus onto tortilla. Top with spinach and carrot ribbons. Roll tightly and cut in half or into pinwheels. If cutting into pinwheels, pack them tightly into a plastic container to hold their shape or spear them with toothpicks to keep them from falling apart. Each wrap makes two kid-sized servings. Disclosure: The Real Deal compensated me for the time spent developing and photographing this recipe. And now, thanks to them, I am addicted to their Sriracha Veggie Chips. I love sriracha! That hummus sounds incredible, and these are beautiful! They would be perfect at a party. I don’t do fresh tomatoes, but roasted or barbecued they’re delicious! I have a small problem with zucchini. But I’m trying to eat it from time to time. Spinach I love and so this wrap. Such a beautiful & bright lunch! I have been obsessed with hummus lately, this looks so tasty. I definitely couldn’t try the Sriracha though. I couldn’t take my eyes off the pictures!! I mean, Gorgeous!! Wow! What a fantastic idea! Definitely need to try this, sounds like a delicious recipe and it looks gorgeous!! I hate cooked capsicum, but I could eat it raw all day long! This recipe looks amazing. Lovely pictures – makes me want some right! 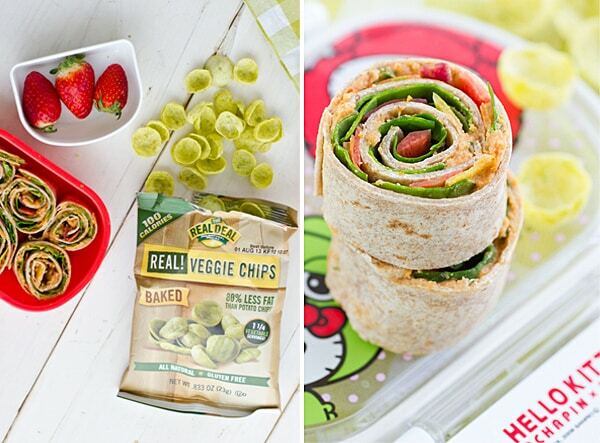 I love a healthy and colorful wraps like these — could eat it all day long! Pinned! I’ve never seen a hummus that uses roasted tomatoes before…that sounds like it would be perfect in a wrap, or a pizza sauce! Those carrot ribbons are so pretty, how could any kid not want to eat them? Very creative use of veggies! I just had a pizza last weekend with hummus instead of sauce and cheese! I was thinking about trying to do something similar at home–it was so good. These look so yummy and colorful =) love it! I’m totally going to try getting my 4 year old to eat this. She’ll eat anything in taco form and loves all the ingredients. Hummus is the only way I can get her to eat carrots. This looks so light and filling! 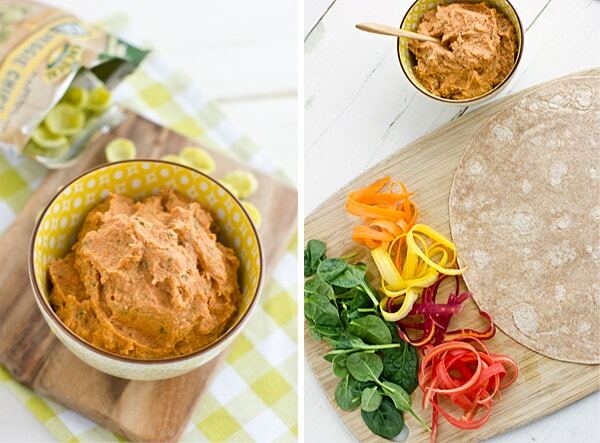 When food starts sounding appealing again I will definitely have to try these – I love me some hummus!